What is the best video codec for game recording, video recording, and screen recording? If you use a high-compression codec, you can get a small video file, but the encoding speed might be slower. If you use a high-quality codec, you can get the best quality video, but the video file size might be larger. If you use a high-speed codec, you can reduce CPU usage, but the video file size might be larger. So, you have to choose the best video codec by yourself to meet your recording needs. (Recording time: one minute, Video resolution: 1920x1080, FPS: 30, Quality: 80). H.264 may be faster than Motion JPEG with high performing computers. The hardware accelerated H.264 codec allows the users to record the target in high speed, with a high compression ratio, and in high quality. Usually, the H.264 codec is not suitable for real-time video recording because it uses much more system resources and the codec speed is much slower than others. However, the hardware accelerated H.264 codec solves the issue with the codec speed. The speed of hardware accelerated H.264 codec (Nvidia® NVENC, Intel® Quick Sync video, AMD VCE) may be faster than Motion JPEG with high performing computers. * Summary: If you can choose H.264 encoder in Bandicam, choose "H.264". Xvid is used in many other applications/hardware and has gained great popularity. Most CD/DVD players, Smartphones, SmartTVs and media players support the Xvid codec. So it will be one of the best video codecs for most users. The Xvid codec is faster than MPEG-1 (Xvid uses lower CPU usage than MPEG-1). * Summary: If you can't choose the H.264 encoder in Bandicam, choose "Xvid". * Summary: If you want to get smaller videos than Xvid, choose "MPEG-1". Motion JPEG (M-JPEG or MJPEG) is a video format in which each video frame is a JPEG image, therefore each frame is a keyframe, so you can edit the recorded video easily. (Motion JPEG will be an ideal codec for most users who want to edit the recorded streaming video in Sony Vegas (or Adobe Premiere Editor). * Summary: If you want to edit the recorded video with a video editing program, choose "Motion JPEG". The video quality is better than MPEG-1/XVID because YV12 doesn’t compress the video. However, the file size is much bigger than MPEG-1/XVID (The file size is smaller than RGB24). * Summary: If you want to get the best quality videos, try "YV12". The video quality is better than MPEG-1/XVID because RGB24 doesn’t compress the video. However, the file size is much bigger than MPEG-1/XVID (The file size is bigger than YV12). * Summary: If you want to get the best quality videos, try "RGB24". If you want to get better quality videos or make smaller videos, you could try the [External Codec] option of Bandicam. You need a high-end computer to use an external codec because most external codecs use much more system resources than Bandicam's internal codecs. 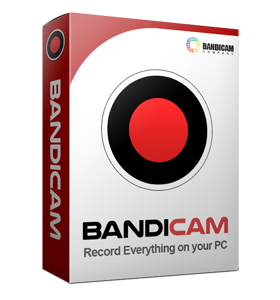 * Summary: If you have a high-end computer, try the "External codec" option in Bandicam. What is the best audio codec for game recording, video recording, and screen recording? If you use the MPEG-1 L2 codec, you can reduce the file size, but you may have a compatibility issue with video editing programs. If you use the PCM audio codec, you can get the best quality audio, but the file size might be larger. So, you have to choose the best audio codec by yourself to meet your recording needs. The table below shows the file sizes, audio quality and codec speed. Advanced Audio Coding (AAC) is a lossy audio compression format and it generally offers higher-quality sound than an MP3 while using the same amount of disk space, or less. Most video editing programs such as Sony Vegas, Adobe Premiere and Pinnacle Studio support the AAC audio codec. * Summary: If you want to reduce the file size and get the best sound quality, choose "AAC". MP2 (MPEG-1 Audio Layer II) is a lossy audio compression format and it is a dominant standard for audio broadcasting. Most media players and YouTube support the MP2 audio format (MP3 is much more popular for PC). MP2 has a good compression rate, small file size and uses much lower CPU usage than PCM. PCM (Pulse-code modulation) is a lossless audio compression format and it is the standard form for digital audio in computers and various Blu-ray, Compact Disc and DVD formats, as well as other uses (such as digital telephone systems). * Summary: If you want to see the recorded video through a portable device or edit the recorded video, choose "PCM". One of the best screen capture programs which allows you to record your computer screen, system sound and microphone.